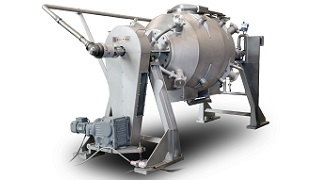 Gentle steam cooking of cereal grains in the Baker Perkins Rotary Cereal Cooker ensures that the texture, flavour and nutritional benefits of wholegrain ingredients are retained in the final product. 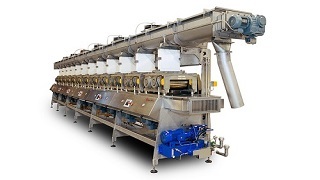 Cooked grains are formed into very thin sheets by passing them between pairs of contra-rotating shredding rolls. Several pairs of rolls are used in series to lay webs on top of one another forming a multi-layered sheet. Depending on the product, it can be oven baked or toasted. Some products can then be frosted, coated with syrup or seasoned to be used as a snack. 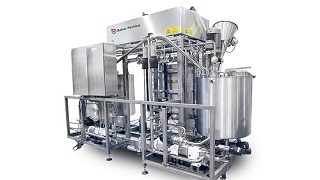 Baker Perkins can supply the equipment and process knowledge for the manufacture of a range of shredded snacks, including multi-layer shredded wheat, 2, 3, or 4 layer corn, rice or wheat squares and bran sticks. 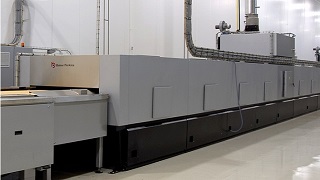 The essence of the shredding process is that cooked grains are formed into a number of very thin sheets by passing them between pairs of contra-rotating shredding rolls. This builds up a bed of shredded product which is then crimped, cut and slit into products ranging from bite-sized pieces to bars. The grains are processed without the need for additional ingredients, giving them impeccable health credentials and enabling their natural taste to be enhanced by a wide range of flavours and seasoning. A range of crunchy snack textures can be achieved using both single- and multi-grain recipes, allowing these products to appeal to both traditional and health-conscious snack consumers. Products are usually based on corn, wheat, bran or rice. The grains are processed without the need for additional ingredients, giving them impeccable health credentials and enabling their natural taste to be enhanced by a wide range of flavours and seasoning. Fruit filled products are also possible.